Nature’s Jewels – Let's Paint Nature! 2010 left with a bang…literally. The last day of the year woke me up with thunder, lovely winter lightning and thunder, how rare! 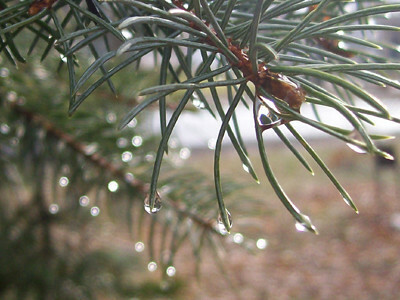 As a result, when I looked out the window in the morning, every evergreen blade held a beautiful sparkling jewel. Oh, how lovely! Like diamonds glistening in the morning sun. The Christmas lights must be put away, but nature’s lights are a bonus. A bonus gift from the Creator, with no negative side effects on the environment. Baby pine in my backyard wears nature’s jewels. Heavy with drops of rain, this picture reminds me of music notes. I wonder what this pattern would sound like? I see two bars of notes here; one on top and one on the bottom. I wish I could play it. Happy New Year to all. I know this year will be better than the last, with certainty. Beautiful sentiments – very well put! 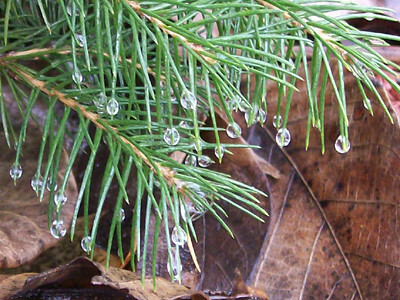 Great photos – the water droplets are like diamonds. Looking forward to how you’ll interpret that in your artwork. Funny because your pictures seem to be spring summer looking not January 2011! Happy New Year to you. This will be a Great 2011! Joy: Thank you very much, Happy New Year! Drowsey: Me too, love that sound! It’s a far distance to hear thunder from Chicago..heh? LOL. Seriously, I love my sleep, but the sound of thunder gets me so excited, I would wake up willingly at any hour of the night or morning!!! Such power! Feel it!! !